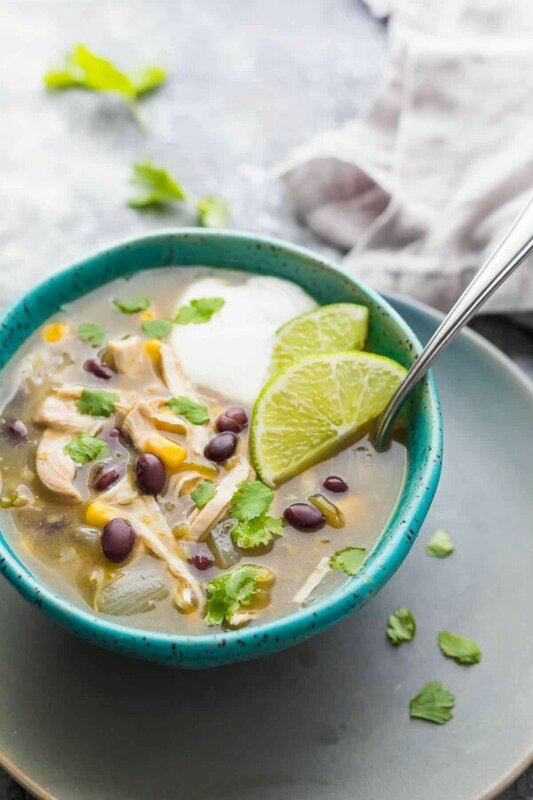 Shortcut Instant Pot Chicken Chile Verde Soup comes together with simple pantry ingredients, and may be assembled as freezer packs for easy freezer Instant Pot weeknight dinners. No pre-cooking, and packed full of delicious tomatillo, jalapeno, lime and garlic flavors! It’s the fifth recipe in our Instant Pot series, and I hope you’re not getting sick of the word ‘Instant Pot’. This will be the last one for a few weeks. Ben keeps trying to put it away in the closet but I keep digging it back out! I am definitely hooked. 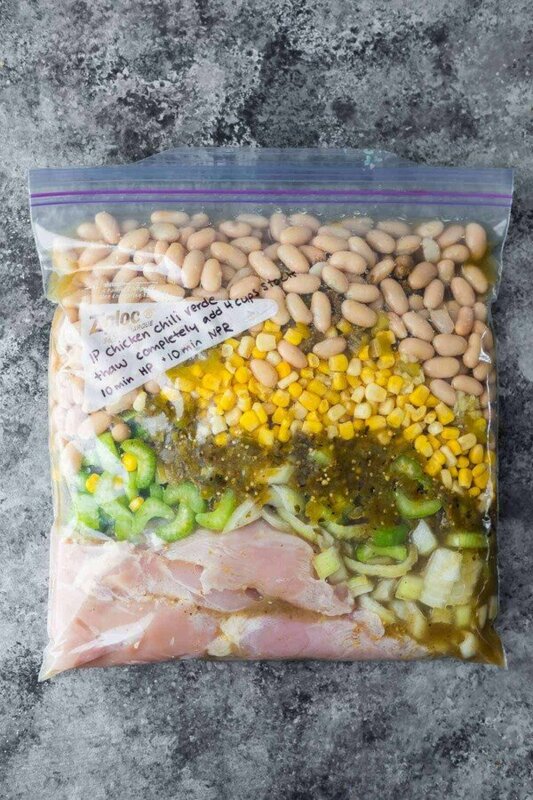 Today’s Instant Pot chicken chile verde soup is another freezer-pack friendly recipe…since it is a no pre-cook recipe, you just toss your ingredients into the bag, squeeze as much air out as possible, and freeze for up to 3 months. When you’re ready to serve? Thaw, then dump into the pot and you are going to have a delicious, healthy dinner on your table in 30 or so minutes. 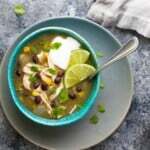 How easy is this chicken chile verde soup to prepare? When it comes to freezer slow cooker recipes, no cook is the way to go…so I naturally wanted to apply the same strategy to my first freezer Instant Pot recipe. Our shortcut involves using jarred tomatillo salsa versus roasting our own up. Even with this shortcut, this soup is PACKED with delicious tomatillo, jalapeno and garlic flavors. In addition, we use canned corn, green chiles, and black beans. I almost always have these items in my pantry, so this soup is a breeze to throw together on the fly! 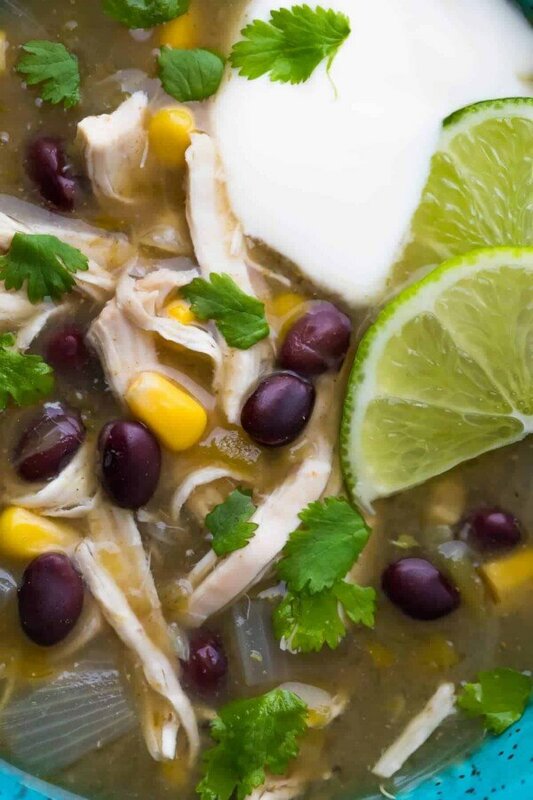 The Instant Pot makes this chicken chile verde soup so so easy to prepare. Simply dump the ingredients in the pot and set it for 10 minutes high pressure. Since the Instant Pot will take 20-30 minutes to come to pressure, this soup will be ready in 30-40 minutes, however the best thing about it is how hands off it is! Once the timer beeps, you will release the pressure, stir in some cornmeal (this brings out some more corn flavors and also thickens the soup slightly), and stir in a squeeze of lime juice. 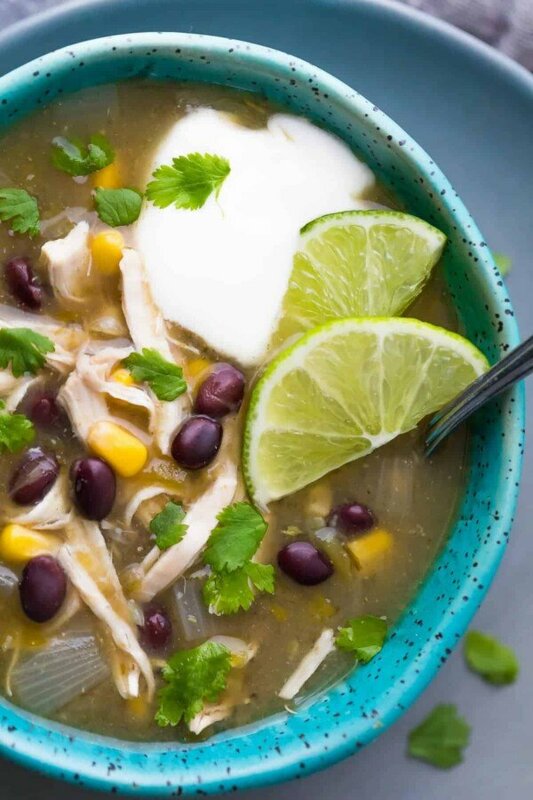 Serve with a dollop of yogurt, fresh cilantro, and some avocado…although not pictured, it’s awesome in this Instant Pot chicken chile verde soup! We also loved tortilla chips (because who doesn’t?) and shredded cheese. 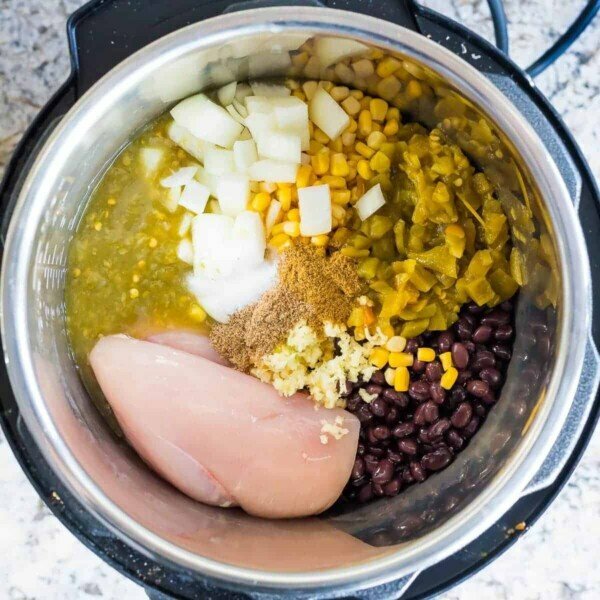 Looking for more Instant Pot chicken recipes? Check out these 7 Instant Pot Chicken Breast Recipes, this Instant Pot Tuscan Chicken Stew and this Spicy Instant Pot Thai Chicken Curry! In the base of a 6 quart Instant Pot, combine all ingredients. Cook on high pressure for 10 minutes. Release pressure immediately (10 minutes natural pressure release is fine, too). Stir in the cornmeal and lime juice. Serve with yogurt, cilantro, tortilla chips and/or shredded cheese. Combine all ingredients except for the stock, cornmeal and lime juice in a large gallon-sized freezer-bag. Thaw completely before cooking using the directions above. * Make sure to use tomatillo salsa and not a jalapeno-based green salsa To cook on the stove-top: simmer for 20 minutes or until chicken is cooked through and shreds easily between two forks. To cook in the slow cooker: cook on low for 4-6 hours, until chicken is cooked through and shreds easily between two forks. This soup is delicious! Quick and easy with lots of flavor. Thank you for sharing your recipe! Hi Tracy! I’m so happy you enjoyed. Thank you for taking the time to leave a review! 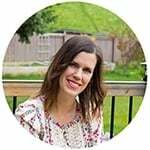 I am looking for a recipe you recently had on your website but now I can’t find it anywhere!! When I click on the link, it says “the page is no longer available”. It was in a post titled “19 healthy slow cooker soups” or something like that. It was a spicy chicken soup, made in a slow cooker, and it had avocado, green chilies, cilantro, etc. Where can I find this recipe?? I love it, but never got a chance to write it down! Thanks. Yes!! Thank you so much! I love it! It’s a cold snowy day in Kansas City. Perfect Soup Day! And my husband made the soup and cooked in the Instant Pot. Delicious! Thanks for letting us know to freeze the meal ahead of time. So helpful for busy schedules. You are very welcome! It is cold here too, so so so ready for spring weather! My family loved this! We did it the old fashion way, on the stove! This soup is delicious! Only change I made is to make a slurry with some of the soup liquid and arrowroot powder to thinken. I tried using the cornmeal and it just clumped together like a dumpling, so I pulled it out and made the slurry. Other than that, it was Amazing! I just printed this. It sounds delicious! I hope you enjoy it, Sera! My husband and I both loved this recipe and will add it to our list of favorites. I thought there was too much broth, but my husband thought it was just right. Either way, we both agreed that the soup was very tasty. Loved the green chili taste and appreciated Denise’s note to make sure to use a tomatillo based salsa rather than jalapeno based because it’s the tomatillo taste that really came through. Many thanks Denise for still including the slow cooker method. Can’t wait to try this! Can I use a regular pressure cooker for Instant Pot recipes? Thank you!